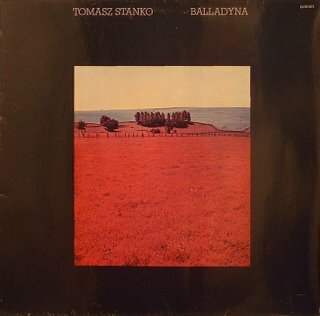 Another ECM album for today, this is Tomasz Stanko's first recording for the label and sees him paired up with the ECM heavyweight rhythm section of Holland and Vesala, and the less well known but equally talented Szukalski on saxes. In many ways this is a fine companion record to yesterday's Dansere, the classic 1975 session from Jan Garbarek & Bobo Stenson's quartet. Like it's companion, this album features two principal sounds - driving, melodic jazz which nods at Stanko's free-jazz roots (with Krystof Komeda) and otherworldly, almost ambient compositions, where the bass and drums drift, providing colour and texture to the sound but little in the way of propulsion. When done well, as it is here, this can be intoxicating, and tracks like 'Balladyna' showcase this effect very well indeed. tomaszstanko.com, his official site, is well worth a look - you can listen to music from throughout his career as well as find out more about this excellent trumpeter. Nowadays he's moved to playing in a very Miles Davis-influenced post-bop style, as shown on his recent UK tour. I was lucky enough to get a ticket for his Birmingham show, and he kept us all entertained with 2 hours plus of moody post-bop blues. The following is an extract from a review of another show on that tour, from the Financial Times' arts section, giving you a flavour of the music presented. "The penultimate gig of the festival, referencing Europe and the rhythms of three continents, opened with arco bass, swishing cymbals and haunting trumpet, but veteran Polish trumpeter Tomasz Stanko and his young acoustic rhythm section soon changed the pace to deliver a fine set of acoustic modern jazz, loosely modelled on the Miles Davis bands of the 1960s. Stanko's focused, breathy sound, spacious phrasing and occasional free-form flourish are all his own. Ebullient pianist Marcin Wasilewski matched the leader."